Stucco may look nice, but you do have to be careful with this wall covering. I maintain that stucco is for more arid climates, so Houston is no place for a stucco home. However, I do enjoy the look of stucco, and I can see why homeowners go for this option. I should be clear: any wall covering material can succumb to damage from the elements, which can lead to further harm to the structure of your home. Spalling happens to bricks. Wood rots away. Moreover, I have seen damage to cement planks from windstorms. Maybe these pvc boards when installed well are the answer. Stucco holds the moisture against the wood framing more, which leads to greater damage. Yet, installers are doing a better job of applying the coatings correctly, which means less possibility of damage. Another aspect of stucco homes is the decorative trim. You can use EIFS or metal trim in various shapes to create design elements for the home. I wonder if we will become more creative with this trim. I usually see fake keystones above a window in trim shaped like an arch, and sometimes these keystones appear at the top of a square trim frame. (A keystone served an important purpose in arches; by connecting the two halves of the arch, they allowed the weight to be distributed down while keeping the arch together). There are trim pieces shaped as long bands along the floor levels. Would a builder add a rosette or a more geometric pattern instead? Will an architect call for a more interesting piece carved out of the EIFS or metal? Or I am letting my imagination run wild? One consistent finding on my inspection reports is the height of the grading. Grading is the surface of the land around the home. Builders plan for there to be a gap between the wall covering and the ground, leaving a part of the foundation exposed. Home buyers do not like to see the foundation, so garden beds are installed, raising the height of the soil next to the foundation. Soil levels also shift during construction because of the work being done. When the time comes to place the grass sheets down, the grading may end up to high. Houses also sink, bringing the soil and wall covering closer. This closing of the gap can lead to insect problems and moisture damage. Look at the photographs below. 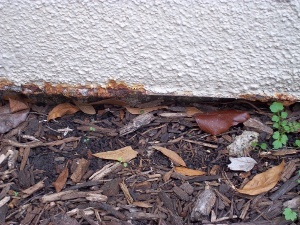 Is that rust on my stucco? Yes it is. As mentioned, decorative trim pieces can be made from metal, but you may find metal in other parts of the wall. The most common place is a channel strip that helps create a gap at the bottom of the stucco. Moisture behind a wall covering will flow down, so it needs a way out. For bricks, this is the weephole. On boards, the last board has space enough to allow moisture to drain away. On stucco, the metal channel helps hold the stucco surface away from the wall behind it. There is a membrane (or there should be- not always installed) which helps keep the water away from this wall, and the gap at the bottom is the drain. This home has a gutter system, but I could see water had gone over its edge. The downspout nearby could also splash water out. Then during a hard rain, you can have a build. The water splashes on the ground, up on the wall. 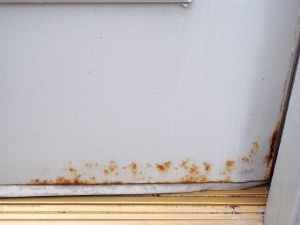 Enough water over time can cause the metal to rust. The second photograph is not of a wall. This is a door in the same area. This door has a metal covering with a wood nailer along the edges. The back splashing water hit the door enough to cause rust. We also may be looking at high water here, such as in a large windstorm. The porch near this wall and door has a drain, so maybe the grading level was felt not to be a concern. Once the rust is visible, you should react. By leaving this situation unattended, you can experience more damage to the wall and the door. How to deal with rusting stucco? First , improve the grading to prevent more damage. Take it down eight inches of foundation exposure. In the home pictured, this becomes harder, since they have a brick patio. Second, call an expert. I do not mind this being a do it yourself project, but stucco is a bit more complicated in this instance. If you were patching stucco, I would say go ahead, but in this scenario, stucco has to be removed and a new metal channel has to be installed. Plus, you may have to deal with the system used to hold the stucco in place. Third, you may want to consider painting a larger portion of the house them the effected area. Paint coatings weather, so color do not always match, even if you are using the same color. Alright, you are being intrepid, and you feel cheated; you want to do it yourself. Remove the stucco and damaged channel back to where you have a good portion of channel. You can see what type of metal channel they used, so you can go to your supplier to buy a new one. Hopefully, you were careful when removing the stucco, and you do not have any damage to the way it was installed. There are new systems on the market involving a solid plastic form, but you may find some older method of wiring (think chicken wire) over a plastic membrane. You will want to copy what the original builder did to create a base for your stucco. But here is another problem: what kind of stucco is it? You might find that they have used an EIFS or a type of cement stucco. You will want to match the type of stucco, so that it expands and contracts like the surrounding material. So does that convince to call an expert? This entry was posted on Wednesday, February 2nd, 2011 at 4:00 pm	and is filed under Home Maintenance-Consumer Info. You can follow any responses to this entry through the RSS 2.0 feed.